If you are in the market for both gas and charcoal grilling (or you can't decide which way to go), this Char-Griller unit may be the grill for you. This small three-burner gas grill has both charcoal and gas fuel capabilities. This model is the combination of Char-Griller's gas and smallest charcoal grills mounted on a single frame. Here is a breakdown of the Char-Griller Duo Gas/Charcoal Model 5050 Grill, from the specific details to its pros and cons. The Char-Griller Duo is a combination of their Char-Griller Grillin Pro Gas Grill and a smaller version of their popular charcoal grills. This gives you a three-burner gas grill and a similarly sized charcoal grill mounted on a single frame with a 12,000 BTU side burner on the side. The gas grill side is a nearly 40,800 BTU three-burner gas grill with medium weight porcelain coated cast iron cooking grates. While some of these components are not the best quality, they are pretty good for the price. The BTU output is a little low for the size, but the barrel shape and thicker steel body holds in heat well enough to give you some good grilling power. The attached side burner is powerful enough to heat a good-sized pot, though the mounting is a little weak so you can't put a lot of weight on it. Other than this, it is a typical low-cost gas grill. On the charcoal side, you get a typical barrel-shaped charcoal grill. The cast iron cooking grates are good for heat transfer and the dual layer bottom holds in the heat and protects the painted finish. If you add on the optional offset firebox you can use this charcoal grill as a smoker. While relatively small, this charcoal grill gives you enough room for many grilling tasks but is limited in indirect grilling space. At a glance, these are the specs of the grill. The question you have to ask yourself is, do you really want two grills bolted together? If this works for you then this is a grill to consider since it won't put you out that much financially. Of course with more parts, there's more of a chance something will go wrong, and since the gas grill side relies on some lightweight components, you might end up with a working charcoal grill attached to a failed gas grill. There are several benefits to owning a Char-Griller Duo Gas/Charcoal Model 5050 grill. The first is its flexibility—need to grill something quickly? Use the gas setting. In the mood for real barbecue? Use the charcoal side. It can even be used as a smoker if you buy the optional side smoker box. It is also an inexpensive gas/charcoal combo, and since Char-Griller has been making charcoal grills and smokers for years, you know the company knows what it's doing. 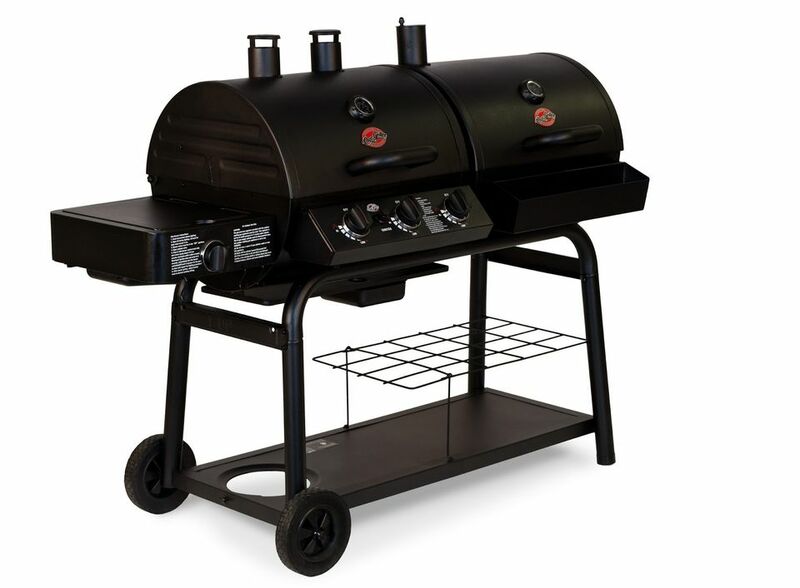 On the negative side, the Char-Griller Duo Gas/Charcoal Model 5050 grill features lower quality gas grill components and lightweight construction.